Join the thousands of commercial real estate professionals around the country who read Business Real Estate Weekly every week for its independent research, accurate reporting and timely coverage of the Arizona real estate market. 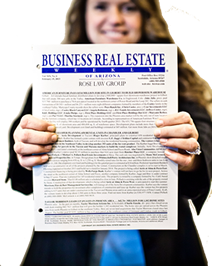 Business Real Estate Weekly (BREW) is a tip sheet highlighting business and real estate activity in Arizona. Founded in 1995, BREW is a weekly newsletter publication focusing on new residential and commercial developments, the sale of income-producing properties and businesses relocating or expanding in Arizona. With a print subscription, you receive 50 printed issues delivered by mail every week. You also receive online access to brewaz.com! This includes a web-based, real-time view of the current issue, our weekly online Emagazine and the fully searchable BREW archives from 1995 to present. Our new and improved archives includes advanced search functions as well as keyword searches to customize your research. Each print subscription also includes a free, custom, 3-ring BREW binder to store your issues. Business Real Estate Weekly is published 50 weeks per year. We do not publish the last week of December or the first week of January. Subscribe to Print + Online Now! With an online-only subscription to Business Real Estate Weekly you receive all of the information that comes in every printed issue of BREW and much more. This reduced rate subscription includes a web-based, real-time view of the current issue, our weekly online Emagazine and the fully searchable BREW archives from 1995 to present with an advanced search function and keyword search capabilities to customize your research. For multiple subscriber discounted rates, email [email protected] or call (480) 905-0500.